We don’t think you can ever have too many chicken recipes. After all, chicken is really versatile, making it a dinner staple in our home. But… it can be a little bland if we don’t put some thought into the preparation, and that’s where this recipe comes in handy. We start by browning chicken pieces, then add hearty veggies, and create a drool-worthy balsamic vinegar reduction, which is definitely the star of this meal! 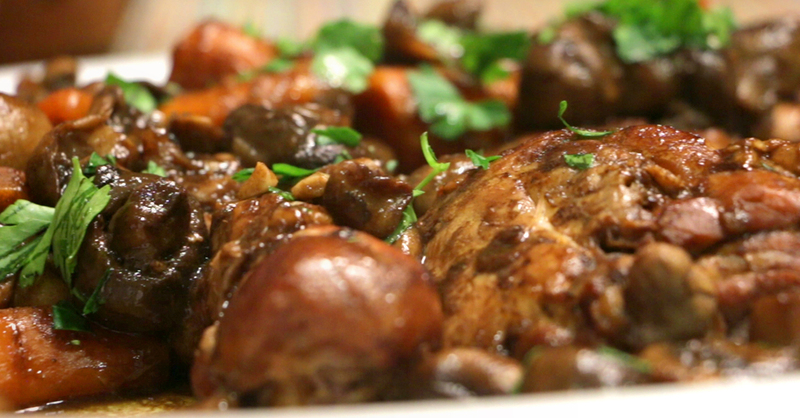 The mushrooms and carrots give the dish a rich, earthy taste, and the glaze makes this healthy meal taste more decadent; and feel free to use skinless chicken for an even healthier option. Either way, your tastebuds are bound to be happy after trying this simple dinner recipe! Season both sides of chicken generously with salt and pepper. Heat olive oil in a large cast-iron skillet or Dutch oven over medium-high heat and, in batches, brown chicken on all sides, then transfer to a separate plate and set aside. Reserving 2-3 tablespoons, drain off fat and saute carrots and onions until tender. About 10 minutes. Add mushrooms and cook for another 6-8 minutes, or until softened, then add crushed garlic and saute for 2 minutes. Season everything with salt and pepper, then transfer vegetables (discarding garlic) to the plate with the chicken. Sprinkle flour into the Dutch oven and cook for 1-2 minutes, whisking continuously, until pasty and smooth. Pour in the vinegars and whisk until smooth. Cook mixture for 3-5 minutes, or until thickened and reduced, then slowly mix in chicken broth. Return chicken to pot and add bay leaf, then bring mixture to a boil. Reduce heat to low, partially cover your pot and let simmer for 35-40 minutes, or until chicken is cooked through. Return vegetables to Dutch oven and serve with reduced sauce.